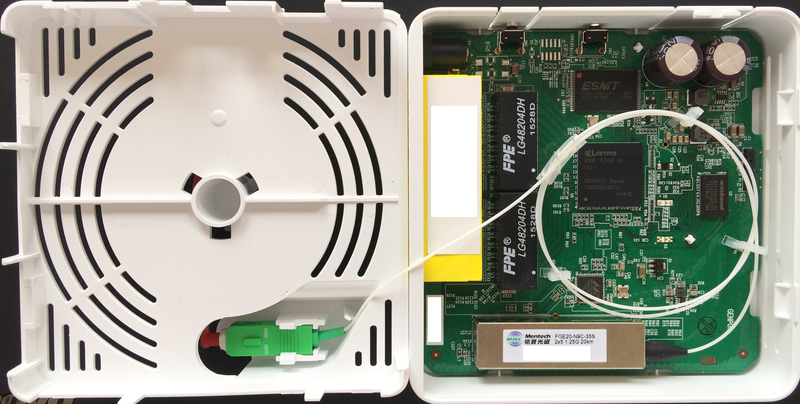 On the WAN side we have a Mentech FGE20-N9C-35S as the optical transceiver module (2×5 form factor) for single-mode fiber in passive optical networks (PON). Optical wavelength division multiplexing (WDM) is used so a single fiber can be used for both downstream and upstream data. The maximum data rate this transceiver can handle is 1.25 Gbit/s (which suggests we’re talking EPON, 802.3ah-2004 here…). The reach without intermediate amplification is 20 km(!). Wavelengths of 1,310 nm (upstream)/1,490 nm (downstream) are used. For LAN connectivity the gateway has 4 Gigabit Ethernet ports, driven by two FPE LG48204DH 2-port LAN transformer modules in a DIP-48 package. The transceiver is a Marvell 88E1512-NNp2 out of the “Alaska” series, 10/100/1000 BASE-T single-port PHY (so it seems that all fiber/Ethernet ports are on the same switch), supporting Energy Efficient Ethernet (EEE) and Advanced Virtual Cable Tester functionality. Update: The switch seems to be a Lantiq VRX318 (or compatible). Firmware is stored in a Elite Semiconductor (ESMT) F59L1G81LA-25T single-level serial (SPI) NAND flash chip in a TSOP48 package. It operates with 3.3V at a clock of 25 ns and has a flash density of 1 Gbit and a bus width of 8 bits. The total memory size is 128 MByte. 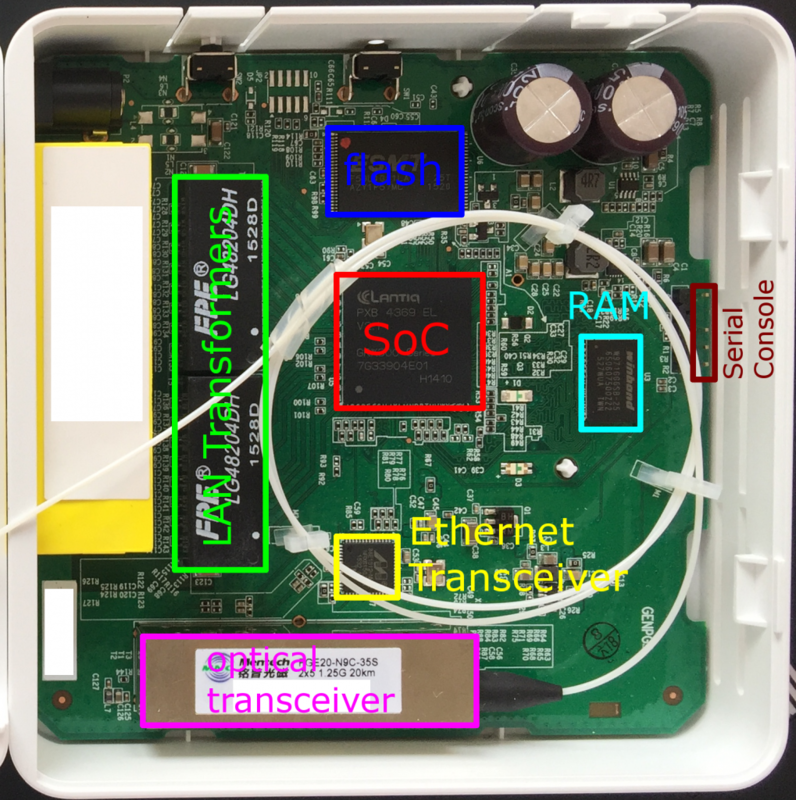 It seems that the broadband gateway is equipped with a serial-console connector. Please let me know if this in any way helps you, or you can contribute to this post. You seem to have a similar setup as my parents, they have (G? )PON from Deutsche Telekom (Magenta L Fiber), with 100 Mbit/s down, 50 Mbit/s up. Yes, long time no talk! At the moment I use OpenVPN on my OpenWrt router to be able to connect into my home LAN, and also as a “remedy” to make open WLANs “a bit more secure” (i. e. in an open WLAN I connect with my WLAN client to my OpenVPN gateway, so that people in the same open WLAN can’t snoop my traffic.) This works great, and I would like to have a similar setup in the future, so my idea was to create an OpenVPN tunnel between my OpenWrt gateway (as the OpenVPN client this time) and my root server in the Internet (as the OpenVPN gateway), so that I can use my root server to “protect” the connection from my WLAN client in the insecure WiFi, plus I have a dedicated IPv4 address that I can use to connect to my gateway at home.